I realized in the midst of all the graphic novels I’ve been reading, I had completely neglected my Sandman collecting. So I immediately ordered Brief Lives, and read it a much shorter than usual time afterward. (I mean, I buy stuff and then don’t touch it for a while, due to the stack.) And I’m so glad, because it’s probably my favorite one. I’m also glad because of how much more depth I’m picking up this time. Foreshadowing and all, sure, but there are just so many layers all over the place that I could probably re-read the series annually and not run out of things to love. In Brief Lives, Delirium (which is to say, the personification of the human experience of delight, inevitably corrupted by time and perspective) decides upon a whim to go in search of her mysterious elder brother, frequently referred to in the series but never identified, who some centuries ago decided to abdicate his responsibilities to his family and to his role; after all, he claims, they’ll continue along this path whether I’m here to oversee things or not. The consequences of her decision are the driving force behind the now-inevitable climax of the series. So, pivotal turning point, plus my favorite character in the cycle, from the moment I first laid eyes upon her. Some fictional characters just do it for me, I guess, in ways that are inexplicable to other people. Well, some of them are probably wholly explicable, but I fancy that the choices I can think of offhand aren’t. Laura Ingalls, when I was reading those books as a kid? A crazy, literally Endless girl that has the ability to render me insane almost in an instant, if she got it in her head that I had done something she didn’t like? (I mean, maybe I did, but maybe I didn’t. She’s crazy, remember.) Okay, I can’t think of anyone else offhand, so I guess it doesn’t happen that often. But still, these can’t be normal tastes. 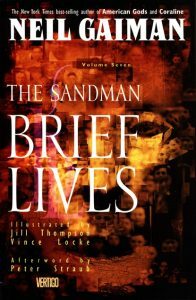 Despite all that, I remain convinced that Brief Lives, with its wide-angle focus on life and death and how much life is enough and which deaths are timely, plus the awesome plot part, is a high point in the Sandman series, if not the high point. But, as I’ve tried to imply, I might be biased. This entry was posted in Words and tagged fiction, graphic novel on February 28, 2007 by Chris. This book has in macrocosm what most zombie stories have in microcosm, the thing that has always attracted me to them. Here’s this world, usually Earth, with people going about their lives in the way that people do, and then suddenly everything is completely different, and it’s time to find out who people really are. World War Z has a pretty cool conceit behind it. During the rebuilding years after the Zombie War, a commission is established to report on everything that led humanity to its direst straits and the manner in which it extricated itself. This is not that report, but it is the personal stories and reflections that were gathered and then deemed to be outside the scope of the commission’s directive, published by the researcher who did the bulk of the gathering. So there are these stories of survivors from all over the world: doctors, military personnel, human transporters, filmmakers, politicians. It’s never spelled out exactly what happened or exactly how, but there are enough stories from enough places to get a wispy, watercolor picture of how things were, and of the myriad ways in which the world is a completely different place in this future that is less than a generation away. It is surprisingly well done, by turns touching, engrossing and horrifying, for someone whose previous résumé is mostly in on-screen comedy writing. Plus, of course, zombies. Right? Right. This entry was posted in Words and tagged fiction, horror on February 23, 2007 by Chris. And now I will demonstrate the usefulness of lowered expectations. Going into Ghost Rider, I expected a big pile of badness surrounding some enjoyable special effects. The special effects were, as predicted, pretty enjoyable. Of course, the fact that they can be in a February movie says more about the current state of the art than it does about the care taken on this particular project. But my sense of wonder has not yet faded on this axis, so I’ll let that part slip by unnoted. Then there’s the plot and the acting. Acting first, as it’s easier. The scenery-chewing characters chewed scenery appropriately. (The Devil, the animatronic actual Ghost Rider, the bad guy, etc.) Sam Elliot made the best of his restrictive archetypal role. Eva Mendes made the best of her role as Bringer of the Cleavage. And Nicolas Cage played per usual. Any time he tried to be funny or dramatic, I was forced to cringe. Any time he tried to be soulful, he was fine. Best of all, though, any time he didn’t really try to be anything, he was pretty good. Especially with deadpan humor, possibly because he wasn’t told it would be funny? I really don’t get how he can be so hit or miss, but he definitely had some amount of hit on this one, which helped a lot. And then there’s the plot. Well, really, the two plots. They’re inextricably tied together, but still pretty distinct despite that. On one hand, you have the origin story. Why did Johnny Blaze decide that jumping motorcycles over things wasn’t enough to get out of life, that he had to melt off his flesh and go all flamey and collect evil souls? How did he get that awesome chain whip? How has it affected his romantic life? Will the cops disapprove? And so forth. This part was pretty good, more engaging than any of the other February Marvel releases I can remember. And on the other hand, you have the story of the Ghost Rider vs. some demons. This was choppy and boring, and the payoff at the climax was too little, too late. I wish I was in junior high or something right now, because ‘Ghost Rider: A Study in Contrasts’ would make an excellently pompous title. This entry was posted in Film and tagged action, Marvel, superheroes, western on February 17, 2007 by Chris. The last few years have seen a resurgence that I thought video had killed entirely. There have been a lot of decent to extremely good horror movies, multiple per year. And they just keep happening. I feel like a kid in a candy store some days, when I’m watching movie previews. Creepy, scary, bloody, occasionally naked… everything a movie should be. Well, maybe more naked. Case in point: The Messengers, in which a family of erstwhile sunflower farmers is terrorized by the same dark forces that drove off (or much more likely killed) the previous inhabitants. Spooky Japanese-style ghosts crab crawl all over the place, frightening the teenage girl and mysteriously silent toddler while leaving the adults unscathed. Well, the mother has a recurring stain to clean. The point is, spooky stuff is happening, and the adults aren’t listening. Even handyman John Corbett, while sympathetic to what our young heroine is going through, has nothing to add in the way of evidence of ghostly happenings. Also, there are a lot of ominous crows flying around. Like I said, pretty decent movie, marred primarily by my concept of one character’s role being better than the one provided by the writers. By the time the ending had somewhat disappointed me, I was already sold on all the good stuff that had come before, so that was okay. This entry was posted in Film and tagged horror on February 15, 2007 by Chris. I think what keeps me from reviewing this graphic novel is the fear of being sucked back into the depression of it all over again. So I sit here staring at the blank screen that is in one incarnation or another over 24 hours old now. Which I’ll have you know isn’t all that uplifting itself, even by comparison. Therefore, I’m going to buckle down and power through it. 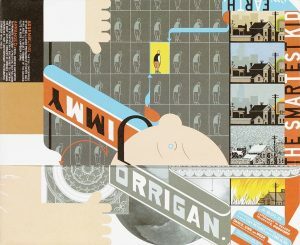 So there’s this dude, Jimmy Corrigan, right? He is named after his grandfather. In one timeline, adult semi-modern Jimmy is slouching towards middle-age in an apparently dead-end job with only his nursing home resident mother for real human contact. In the other timeline, young James is trying to survive his abusive father’s daily tirades while navigating the casually racist turn of the century Chicago school system. Both of these people are missing a parent, both of them are desperately unhappy with their circumstances, and both of them are due for a gradually worsening spiral from these rosy points of origin. Without all of the misery bringing me down, there would have been a lot of interesting things to take note of. For example, the women in Jimmy’s life almost never have faces. (Notably, the only ones that do are women that James has seen.) Both men have vibrant fantasy lives; James’ allows him to briefly escape his genuinely tragic circumstances, while Jimmy’s is mostly farcical reimaginings of how his life might be going instead, each of them ending more pathetically than the already quite low reality. I suppose the point of the exercise is to watch each of them gradually get past their current lives and into a better place? I will opt not to reveal the secret answer to this question. I am willing to divulge that Jimmy Corrigan is not the smartest kid on earth. In fact, that may have been an example of this newfangled irony thing I keep hearing about. This entry was posted in Words and tagged fiction, graphic novel on February 14, 2007 by Chris. 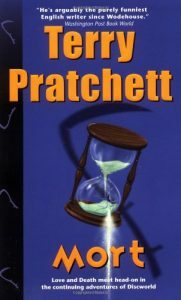 I have purchased more than half of the Discworld books by now, but I haven’t read any in a long while, because of a continued failure to find the actual next one. Then, last month, I finally did, which means books and books stretch before me before I need to have found the next missing link. Which is nice. I like it when little stresses disappear. I mean, it shouldn’t be a stressor at all, except that I wanted to read the books. So, then. Also good is the book itself, Mort. For one thing, it is unquestionably funnier than its predecessors, relying a lot more heavily on situational humor rather than bits of random oddness. The random oddness is there, as it should be; it just isn’t the centerpiece. Also and perhaps due to the same root cause, the story is a bit deeper than at least the first two, if not necessarily Equal Rites. In Mort, our titular hero takes a most unusual apprenticeship and learns that even the least common of jobs can have their ups and downs. Okay, that was trite even for cover-copy, much less a review. It’s like this. Death (the anthropomorphic personification, thin fellow, carries a scythe) opts to take on an apprentice, pass on the trade as it were. Mort learns the importance of the job that might one day be his, Death learns the importance of a vacation, and the reader learns, at excruciating repetition, the way that light and dark work on the Disc. But really, other than that (which I’m sensitive to after the last Anita Blake book), this was a fun, breezy book. The breeziest examination of causality and predestination I’ve ever read, in fact. This entry was posted in Words and tagged Discworld, fantasy, humor on February 8, 2007 by Chris. So here’s a discovery. Ever since I started reviewing stuff, I’ve been more apt than previously to only see something I’m pretty excited about seeing. I hadn’t really noticed that trend, until last weekend I went to a movie wholly because someone else wanted to without much impetus of my own, only to discover that I’ve been able to come up with nothing much to say about it for at least three days now. Which is kind of sad when you consider that I still enjoyed it; it just didn’t seem to give me any kind of craggy surface to latch onto and get an impression from. Smokin’ Aces is one of those collision course films. You take a lot of different characters, wind them up, point them at some common target, and watch the body count start piling up as they inevitably interfere with each other. In this case, magician Buddy “Aces” Israel is the common goal of a number of assassins, a few bail bondsmen, and an FBI protection team after word leaks out that the mob boss Israel is scheduled to testify against has promised to pay a million dollar contract to The Swede when he brings him Israel’s heart. Bloody violence, games of cat-and-mouse and occasional hilarities ensue. Also, it’s the Nevada mob, so there are a lot of hookers. The film doesn’t have a lot of depth, which is okay; it’s not supposed to. It carries you through sheerly by force of adrenaline. In fact, the only bad thing I can say about it is that the closing reel has enough depth that it feels like part of a different movie. But if you can forgive that, there’s a reasonably star-studded list of journeyman actors and a beltload of bullets to get you from start to finish. If you’re cool enough to get past the velvet rope and the bouncer at the door, that is. It’s just that kind of movie, and it knows it full well. This entry was posted in Film and tagged action on February 1, 2007 by Chris.